Three original recipes and photographs on the ABC (Australian Broadcasting Commission)'s Foodi app for Ipad alongside recipes by Maggie Beer, Simon Bryant, Matt Moran, Bill Granger and Poh Ling Yeow. Download the FREE app. Adelaide Matters: interviewed for two-page article about pavlovas and festive desserts. December 2015. Margin Media: Top 10 Australian Food Blogs. June 2015. The Feedfeed: Best Fall and Winter Cocktails. June 2015. The Urban List: 6 Food Bloggers Whose Lives We Want To Steal. 29 April, 2015. Woman's Day: profiled as an Instagrammer to follow in December, 2014. The Age: interviewed for Top five tasty apps for finding food in November 2014. Channel 7's SA Life: interviewed for Adelaide Food Bloggers in October 2014. Aspire Magazine: interviewed in Hungry for Blogging in June 2014. 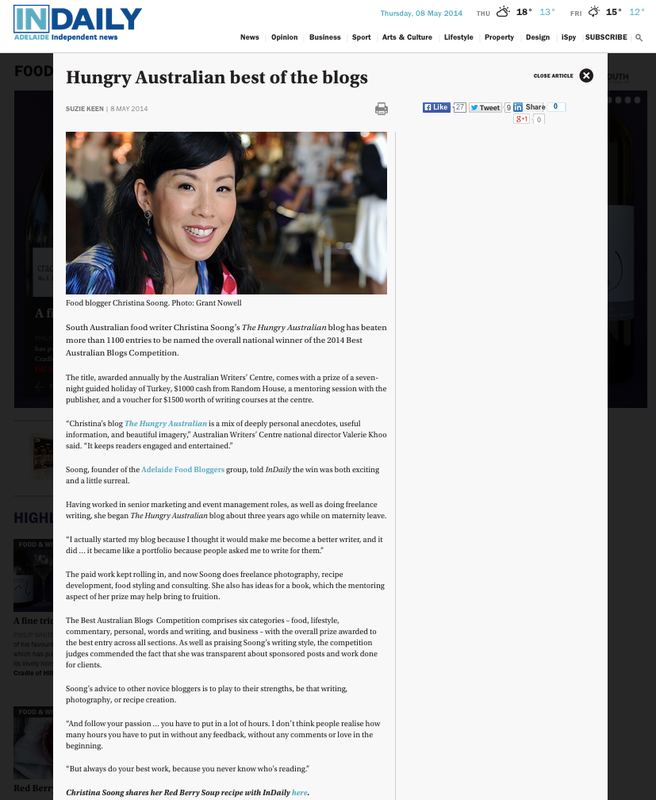 In Daily: interviewed in Hungry Australian Best of the Blogs in May 2014. 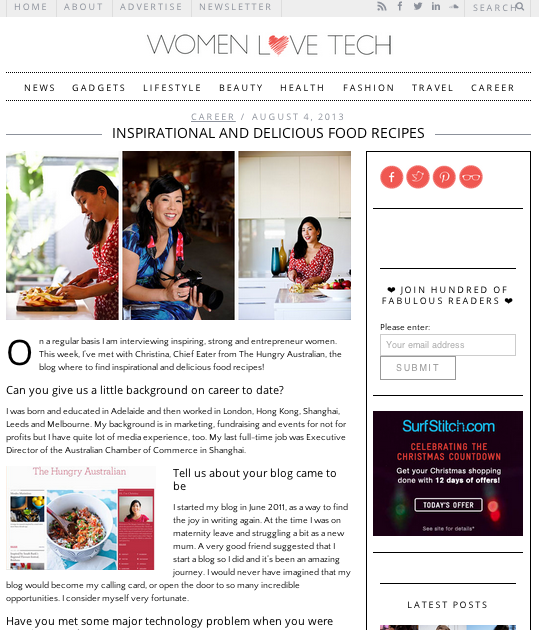 Successful Blogging: interviewed in How Blogging Turned a Foodie into a Food Professional. Business Insider: mentioned in Eating their Words feature in April, 2014. SA Life Magazine: mentioned in Eating their Words feature in April, 2014. Gourmet Traveller: mentioned in Hot Plates column for Eating Their Words on March, 2014. Food and Home Entertaining South Africa: featured in Five Fabulous Foodie Femmes to Inspire You in January 2014. You Gotta Try... Barossa Valley short film: interviewed by Urtext Films as part of SA Tourism's Through Local Eyes project in January 2014. Campaign Brief: featured in Bacardi Lion Appoints Edge in December 2013. My Future: interviewed about my career and blogging in November 2013. Women Love Tech: interviewed on August 4, 2013. Pedestrian TV: featured in The Essential Guide to Essential Internet Time Wasters on March 7, 2013. Apartment Therapy: 6 year old birthday party profiled in Best Kids Parties on April 11, 2013. She Knows: interviewed in Money Saving Marital Meals in December 2012. In Daily: interviewed in What's for Christmas Dinner on December 11 2012. ABC Radio: interviewed about almonds and featured on the ABC Radio website on October 10 2012. Radio National: Food Blogger of the Week: "if one of your New Year's solutions is to sharpen up your food writing skills by blogging but you don't know where to begin, these tips from The Hungry Australian, who has been there, done that herself, may be just the resource you need." InDaily: interviewed in Food Bloggers Stake Their Claim on August 16 2012. Glam Adelaide: quoted in Adelaide set for food blogger frenzy on August 6 2012. 3RRR's Eat It (Melbourne): interviewed about the Great Australian Pavlova Blog Hop. Listen to the podcast. 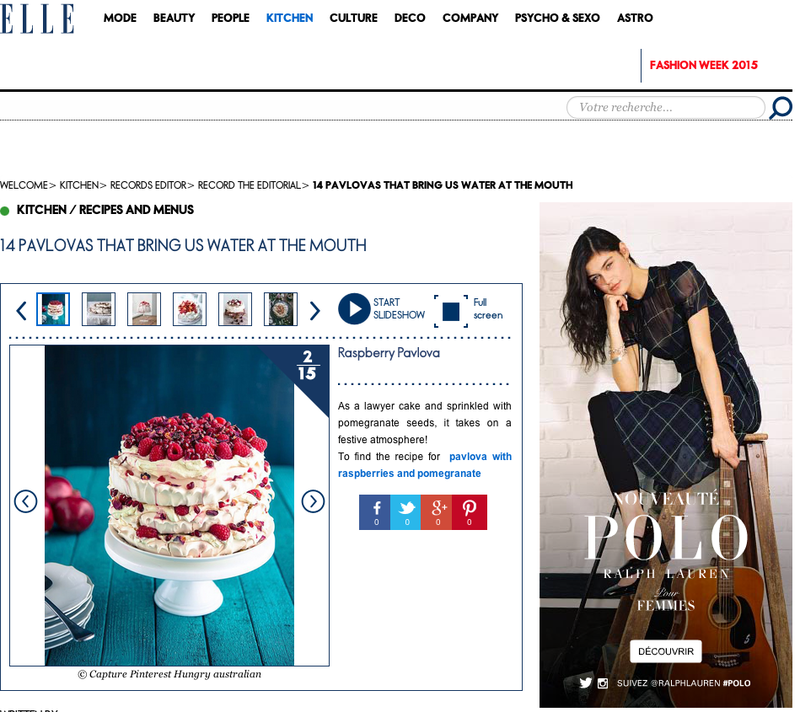 Sumptuous: featured Foodie Online in December 2011/January 2012 issue. "The Hungry Australian - Christina started her blog about 6 months ago and already her informative and friendly coverage of all-things foodie have earned her a dedicated following. You'll find everything from her experiments in the kitchen to interviews with chefs and restaurant reviews. hungryaustralian.com." Yummly: Featured Food Blog and Certified Yummly in October, 2011. Foodista: Featured Food Blog of the Day on February 18th, 2012 and October 5, 2011. 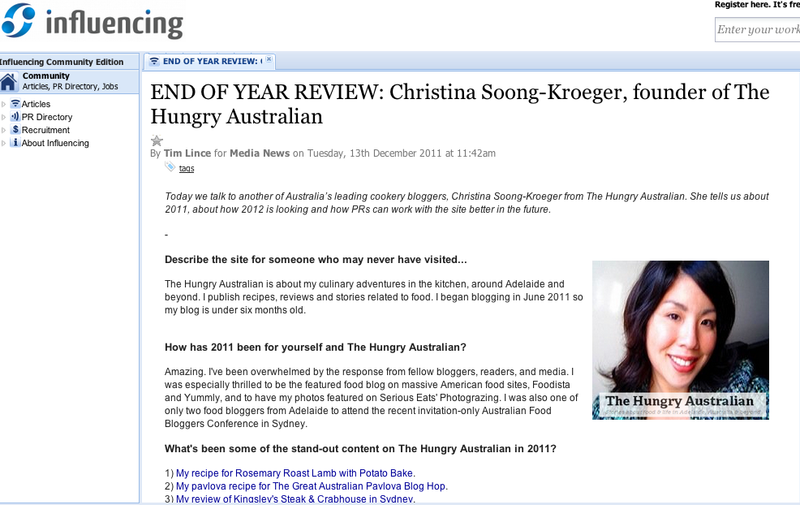 Influencing: interviewed about The Hungry Australian and blogs working with PR companies on December 13, 2011. In Daily: Red Berry Soup in May 2014. She Knows. Featured in Winter Treats to Tickle Your Tastebuds on June 25th, 2013. Kidspot.com.au. Featured in 10 Dinners Under 10 Minutes in March 2013. The Huffington Post. Two original recipes featured on a Stir Fry feature on January 6, 2013. She Knows. Fig, Proscuitto and Pear Salad included in Who Said Salad Had To be Boring? in December 2012. The Whoot. Fiery Vietnamese Salad featured in December 2011.